Conceived as a challenge to long-standing conventional wisdom, Creating the Future is a work of social history/cultural criticism that examines the premise that the progress of art in Los Angeles ceased during the 1970s--after the decline of the Ferus Gallery, the scattering of its stable of artists (Robert Irwin, Ed Kienholz, Ed Moses, Ed Rusha and others), and the economic struggles throughout the decade--and didn't resume until sometime around 1984 when Mark Tansey, Alison Saar, Judy Fiskin, Carrie Mae Weems, David Salle, Manuel Ocampo, among others became stars in an exploding art market. However, this is far from the reality of the L.A. art scene in the 1970s. The passing of those fashionable 1960s-era icons, in fact, allowed the development of a chaotic array of outlandish and independent voices, marginalized communities, and energetic, sometimes bizarre visions that thrived during the stagnant 1970s. Fallon's narrative describes and celebrates, through twelve thematically arranged chapters, the wide range of intriguing artists and the world--not just the objects--they created. 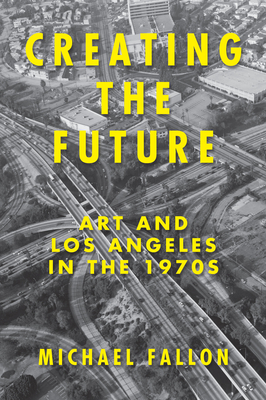 He reveals the deeper, more culturally dynamic truth about a significant moment in American art history, presenting an alternative story of stubborn creativity in the face of widespread ignorance and misapprehension among the art cognoscenti, who dismissed the 1970s in Los Angeles as a time of dissipation and decline. Coming into being right before their eyes was an ardent local feminist art movement, which had lasting influence on the direction of art across the nation; an emerging Chicano Art movement, spreading Chicano murals across Los Angeles and to other major cities; a new and more modern vision for the role and look of public art; a slow consolidation of local street sensibilities, car fetishism, gang and punk aesthetics into the earliest version of what would later become the "Lowbrow" art movement; the subversive co-opting, in full view of Pop Art, of the values, aesthetics, and imagery of Tinseltown by a number of young and innovative local artists who would go on to greater national renown; and a number of independent voices who, lacking the support structures of an art movement or artist cohort, pursued their brilliant artistic visions in near-isolation. Despite the lack of attention, these artists would later reemerge as visionary signposts to many later trends in art. Their work would prove more interesting, more lastingly influential, and vastly more important than ever imagined or expected by those who saw it or even by those who created it in 1970's Los Angeles. Creating the Future is a visionary work that seeks to recapture this important decade and its influence on today's generation of artists. Michael Fallon is a longtime writer and editor on arts and culture based in Minneapolis, where he serves as the Executive Director of Minneapolis TV Network, a public access community media center. He has published hundreds of reviews, feature articles, essays, and profiles in print and on the internet for City Pages in Minneapolis, the Orange County Weekly, the St. Paul Pioneer Press, Pittsburgh City Paper, Minneapolis-St. Paul magazine, the Utne Reader, Public Art Review, American Craft, and Art in America. Fallon received national attention for his blog about the struggles of artists, The Chronicle of Artistic Failure in America. His current blog--Pacific Ocean Blue: Tales of L.A's Past/Tales of L.A. Today--is focused on the art, culture, and history of Southern California. Fallon studied art at UC Berkeley and in the graduate program in art at Cal State Fullerton, and completed a Master's in Arts Management at Carnegie Mellon University in Pittsburgh, where, while spearheading a comprehensive study of the nation's aging artists, he interviewed Californian luminaries like Llyn Foulkes and George Herms. Please visit writermichaelfallon.com.